What size generator would you recommend if it was only used for charging the battery? Also, I want to hook up a second battery and would like any advice or info on doing this. if it's just for recharging, then you only need a 1000w. but the Honda 2000w costs only a little more than the 1000w model and you can run everything, including the microwave, except possibly the a/c. for me, it's worth paying a little more for the 2000w, cause all the 1000w can do is recharge the battery. 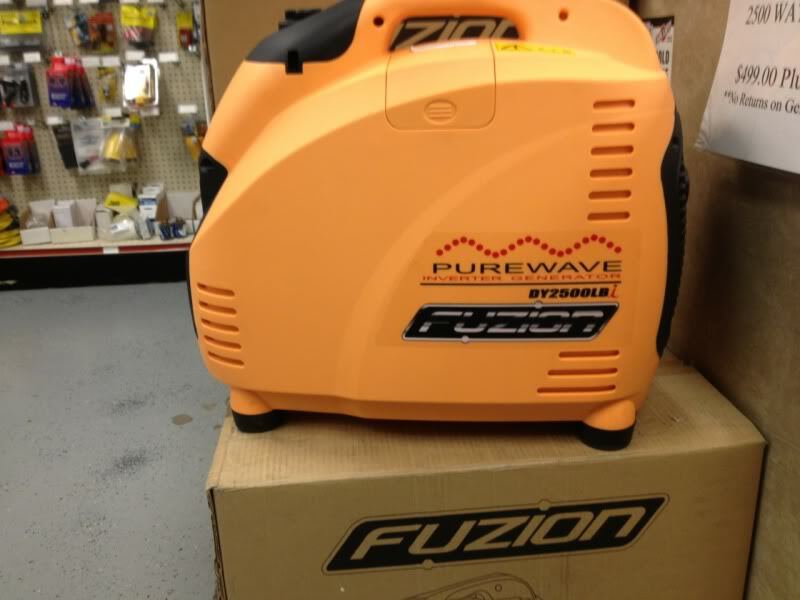 Yeah someone told me about a "knock off" 800 watt generator they saw on sale for $99......come to find out it was at Harbor Freight.....yeah I'll pass on that. Your probably right I should just get a bigger one and can use the microwave nd stuff while charging. 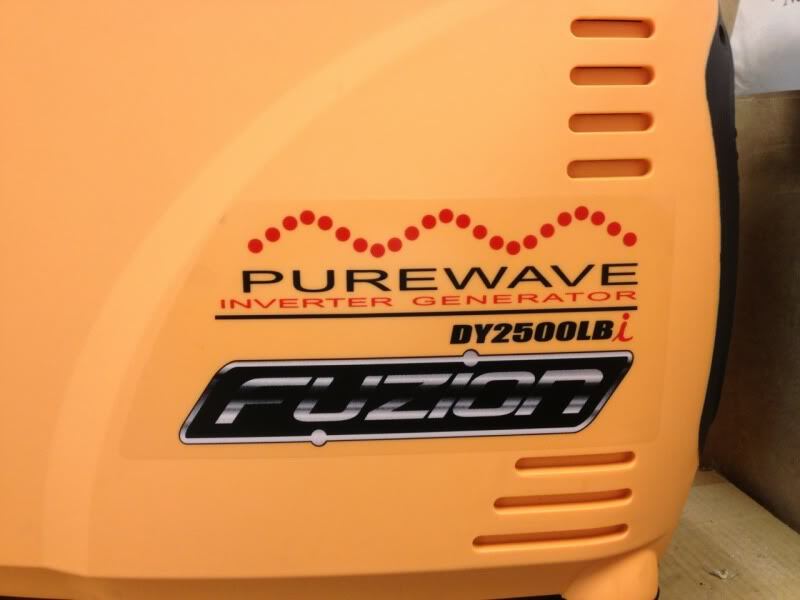 Does anyone have or ever heard of a Fuzion DY 3500 LBI generator? My local RV store (Boat & RV superstore) has them on sale for $499, regular price is $799. I can't find any info online about them. I called the store to find out the exact model to google it and was told Fuzion is a Japanese company contracted by Boat & RV to make their small engine products they sell (4wheeler, ATV's, UTV's, generators, etc). Was told that they are a Yamaha clone and Yamaha parts will interchange with Fuzion and vis-versa. The parts guy seemed really impressed with them and said out of the 50 some they sold right before hurricane Sandy that 1 came back. They gave the guy a new one and 5 minutes after he left one of the service guys had "the broken one" running. NEVER heard of that generator, on any of the 6 RV forums i'm on and that's not a good thing. cause i read every generator thread on all of them and have never heard of it. is it a inverter generator and what's the decibel rating? i'm betting that the engine is by Yamaha but not the rest. a similar one with the Yamaha engine, is being sold at many Costcos. i'm also willing to bet that the generator is built in China, not Japan. maybe the engine is but the rest is built in China. anything above 58db is going to be very loud. I called over the store and asked about decibels and inverter or not. Yes it's an inverter generator. The guy I spoke with could not find a decibel rating on the box. I picked up a Honda EU1000i off Craigslist for $500. It was only used for one week by a photographer that used it for a shoot. At first I thought it may not supply enough power for my needs but it's been more than enough. I run the fridge and water heater off propane. I can run lights, TV's, DVD, stereo, coffee maker, toaster, misc. electronics and recharge the battery for 6-8 hours on a half gallon of gas and it only weighs 29 lbs. It's so quiet I can keep it running late at night and some of my camping neighbors said they didn't mind because they couldn't hear it anyway. Got one of those for free. It does the job, although I rather have an inverter generator. When the money is there, I will get one. that says a lot. 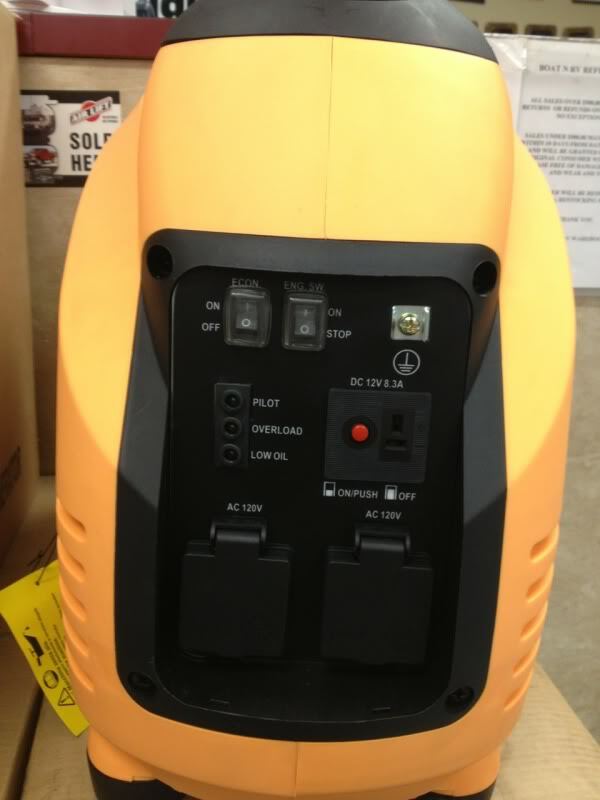 you need to worry about any generator that the manufacturer does not print what the decibel rating is. Ok I bought the Fuzion this afternoon. It was still on sale for $499 and since I bought my TT there I got an extra 10% off. I messed up, it's a 2500 watt. Got home and took it out of the box, filled the oil and gas and it fired up first pull. This is my first small generator but I heard a few Memorial Day weekend, a power house and a Honda. So based on hearing them last weekend it's comparable sound wise, I don't mind standing right behind it, it's not bad at all on the other side of the trailer and its just a little hum from inside the camper. It does surge a little bit in econo mode but seemed to clear up the longer it ran. Here are a couple pics and videos of it running.